We all know very well that the Google have already allowed us to view Google search history and delete Google search history. But a latest and interesting news for all of us is that – Now, Google allows to Download Google Search History. Yes, it’s true! Google updated this news on their Google Help page and officially explained that now user can easily download a copy of their past searches to view a complete list of the terms they’ve searched for. The saved history of searches will help users to access their data when and where they want. It’s really a great news for all the Google account users. People are so happy to know that now they can be able to download all of their saved search histories and view them offline according to requirement. Step (1): First of all, go to your Web & App Activity page. Step (2): From the top right corner of the page, click on the Options icon and select Download. Step (3): Now, a pop-up box called “Download a copy of your data” will appear on your screen. Here, click on Create Archive button. Step (4): Just after the click, It will start preparing your archive to download. The archive preparation time will depend on the amount of data (search history) you’re downloading. Step (5): Once it is completed, you will receive an email notification titled as “Google Web History” along with the download link. 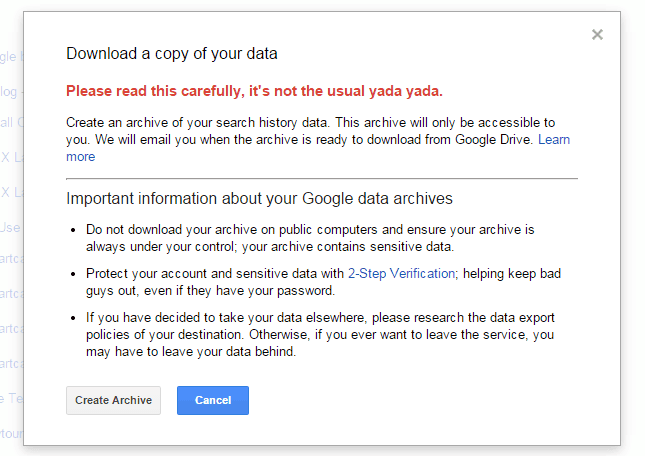 Step (6): Since, the Archive is stored in your Google Drive account by default. So, click on “View in Drive” link and download Google Search History from the Google drive. That’s it! Thus, you can easily download your past searches and see a list of the terms you’ve searched for. (i) Please, don’t download your past searches (history of searches) on public computers. (ii) Use 2-Step Verification method to protect your account and sensitive data from the prying eyes over the Internet. 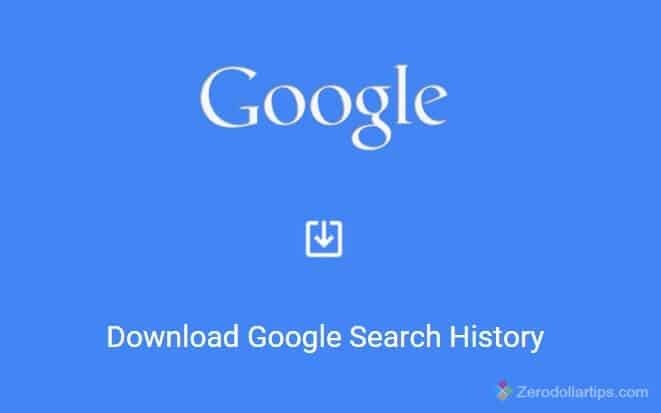 I hope, you found the detailed information and step by step tutorial about Google search history download. Feel free to share your view with us through comments about the guide how to download Google search history.